Claudia Torres is at home in the woods of Western New York where she walks daily in the park with her dogs. In a former life, she was the creator and host of the public access television show Truckstop Intellectuals, which showcased local artists and writers. Everyone in this poem is a visitor; some are visiting from further away than others, but the scene of the poem is still populated by a random polyglot. It is a slice of the world. The majority of the patrons are anonymous, mentioned only to show how a group of rowdy teens is agitating the atmosphere. The speaker isn’t exactly behaving, either, chanting for coffee. But then we meet the Indians themselves, standing in line in full dress/…exquisite. They smile, knowing they have everyone’s attention and knowing they have won the room from the teenagers. It’s a social game we all play, regardless of era or culture. 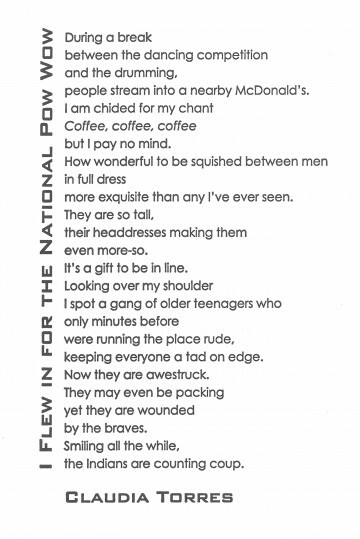 The Native Americans in this poem are larger than life. Their strength is obvious, even as they stand still. A similar strength is present in Gothic typefaces which have thicker lines and create a similar strength on the page – these letters stand erect, delivering their words with precision. They mean business. Everyone who looks at this page senses it, just as everyone in the poem’s McDonald’s knew the Indians were really the ones in charge.